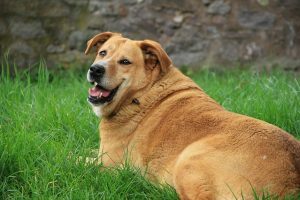 As we wrap up our Paws to Protect topic of Nutrition this month, let’s tackle a subject that is one of the most common nutritional concerns we encounter in the veterinary clinic: Obesity. 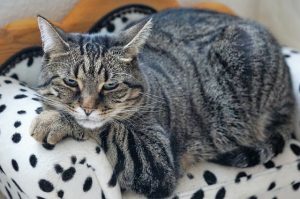 Now, before you decide your pet’s weight is perfectly fine, or that you don’t even want to hear about the fact that your pet might be overweight, think about the following statement. Obesity is a dangerous condition for pets. Dangerous? Yes, dangerous. It can cause your pet to have a reduced life expectancy. It can contribute and/or lead to numerous health conditions and problems in your pet (e.g. Type 2 Diabetes, hypertension, kidney disease, arthritis, inflammation, etc.). Furthermore, think about how obesity can affect your pet’s quality of life on a daily basis (tiredness, increased breathing efforts, slow to get around, unable to run and play or take long walks, and the list goes on). As pet owners, we control what our pets eat. One of the most important decisions you will make for your pet each and every day will be what you feed him or her. Yes, diet type and quality are important. But so is the amount of food your pet receives (and this includes treats)! So, are you curious about where your pet might fall on the weight spectrum? There are a few tools you and your veterinarian can use to evaluate this question. What is your pet’s weight? The number alone is not enough to determine ideal weight, but it can tell you whether the weight has gone up or down lately, as well as how the weight might compare to the typical weight of other dogs or cats of the same breed. What is your pet’s body condition score? The body condition scoring system is an objective method that veterinarian’s can use to put a score to the amount of fat and muscling. This number helps in understanding where a patient falls on the weight spectrum. Curious about where your pet might fall in the scoring system? Give it a try using Purina’s Body Condition Score tool for dogs and cats. What are your pet’s body measurements? Measurements can further clarify the extensiveness of obesity. How many calories is your pet eating each day? Most pet owners pay attention to food quantity recommendations from the food manufacturer, not the number of calories. But you can easily determine calories by looking at the bag to see how many calories are in a cup (or can) of food. You can see average daily caloric needs for dogs and cats here. It is critical to keep in mind that daily calorie amounts are not the same for all pets. Caloric needs will vary depending on things such as life stage, the presence of other medical conditions, the amount of daily exercise, and whether or not the patient needs to lose weight. The amount of food the manufacturer recommends may or may not be the right amount for your individual pet. Your pet’s veterinarian can take all these things into consideration to decide on the best target daily caloric intake for your pet. Does your pet exercise? 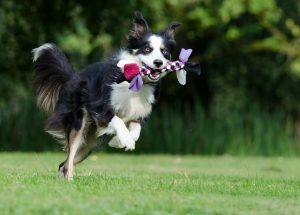 A goal to strive for can be 30 minutes of activity per day for dogs, and three separate 5-minute play periods for cats. Of course, these recommendations would not necessarily apply to pets with medical concerns, young or senior pets, or breeds that may be predisposed to breathing problems if exercised too vigorously. Your veterinarian can help you create a fun and safe activity plan for your pet. A gradual switch to a weight loss diet. There are many weight loss diet options available! You can learn more about Lawndale Veterinary Hospital’s Weight Loss Incentive Plan here. For some patients, blood work may be recommended to help rule out underlying medical conditions that might be contributing to excess body weight. Remember to be patient! This process can and should take time. Pets must not lose weight too quickly as this can lead to serious medical problems. Dogs can generally lose about 1 to 3 percent of their body weight per month. 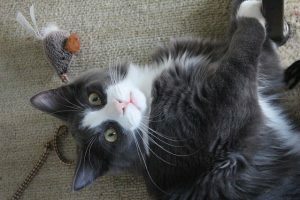 Cats can generally lose about 0.5 to 2 percent of their body weight per month. Weight loss plans will therefore take months to even a year, depending on the patient and amount of weight loss needed. We have the power to give our pets a life of good nutrition and healthy weight maintenance. Lawndale Veterinary Hospital wants to work with you to help your pet attain (and maintain) a healthy weight. Your pet will certainly feel better at a healthy weight. Even more, you may help your pet avoid numerous health consequences down the road!